Spiderwort is an herbaceous perennial that arises from a cluster of rather stout overwintering roots. Stems may be solitary or more commonly clumped, and usually grow unbranched, reaching heights up to 40 cm tall. Stems are smooth or bear scattered short hairs. Leaves are 2—5 per stem, attached by means of a leaf sheath that is 13 cm long. Leaf blades are dull green, elongate, ending in a gradually tapered tip, flat or keeled, smooth (without hairs), and 1—3.5 cm long by 0.5—2.5 cm wide. Flowers occur in tight clusters located at the stem apex; bracts similar to the leaves occur below each flower. Flowers are ephemeral, each lasting about one half day. However, flowers are produced in daily succession for several weeks. Each open flower is elevated above the cluster of buds and spent flowers on a hairy pedicel up to 3.5 cm long. 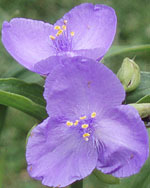 Linnaeus gave spiderwort the scientific name Tradescantia virginiana. The genus name commemorates John (the elder) Tradescant, gardener to Charles the First of England and the species name indicates that this plant was first known from specimens collected in Virginia. In fact, Tradescant’s son (also John) traveled to Virginia in the 1630s and sent many specimens of horticultural interest back to England. The genus Tradescantiacontains about 70 species found in temperate and tropical regions of the Americas; a group of about 17 species, all native to the US, are particularly close relatives of T. virginiana, and many of these are known to hybridize. The spiderwort genus is classified in the plant family Commelinaceae, which in Virginia is also represented by native and invasive species of the genus Commelina (commonly known as dayflowers) andMurdannia keisak, adventive from Asia. Virginia spiderwort and other species of Tradescantia appear on lists of both edible and poisonous plants. Leaves and flowers have been reputed to be edible. However, allTradescantia species bear clusters of needle-like crystals (raphides) in their internal tissues and these may well be the source of relatively minor skin irritations that can arise in some people upon contact with the plant. Caution is advised before ingesting any wild plant. Virginia spiderwort inhabits dry upland forests, rocky open woods, and wood edges, typically in acid soils. It seems to prefer shaded situations but can sometimes be found in full sun. Two other species of spiderwort, T. ohiensis and T. subaspera, can occur withT. virginiana throughout much of eastern North America. The smooth spiderwort (T. ohiensis) can be distinguished by non-hairy pedicels and sepals (except for a tuft of hairs at the apex) and its generally glaucous-waxy leaf surfaces.As its common name implies, the wide-leaved spiderwort (T. subaspera) differs by leaf blades wider than those of the other two species and also wider than its own leaf sheath circumference (blades are often 2—5 cm wide). Bumblebees are the most important pollinators for all three species, and natural hybrids do occur. These natural hybrids can be recognized by the commingling of characteristics otherwise typical of individual species. This species adapts well to cultivation, is easy to grow, and reliably makes an attractive garden specimen. It grows best in fertile loam, and prefers somewhat acid soils, but it is adaptable to other conditions. Moderate moisture will be adequate if grown in light shade; more water may be necessary for plants grown in full sun. Cutting stems back after flowering often stimulates re-blooming. Spiderworts can be propagated by division of the rootstock or by seed. Fresh seed germinates readily; dry seed benefits from a few weeks of cold stratification. Under certain garden conditions Virginia spiderwort can become rampantly aggressive; regular uprooting of unwanted seedlings and thinning (division) of adult plants will help keep it within bounds. Garden plants are generally free of disease. As noted above, Tradescantia virginiana is known to hybridize with two related species, T. ohiensis and T. subaspera. Numerous horticultural selections have been developed from hybrid populations that mix genetic material from all three species. These horticultural cultivars have a wide range of flower color, ranging from deep purple to pure white and nearly every shade in between. Many (perhaps most) garden plants that are labeled T. virginiana are hybrid combinations of all three of these species and should be called T. x andersoniana. Virginia spiderwort is widespread in the eastern US where it can be found from New England to Georgia, Minnesota, and Missouri. It is similarly widespread in Virginia, having been documented to occur in about half of the state’s counties. Flowering occurs from April to July. The main threats to this relatively common native species in Virginia are habitat destruction and collection of wild plants for horticulture. South of Virginia, T. virginianabecomes significantly less common and is a species of conservation concern in the Carolinas. Gardeners should not collect Virginia spiderwort in the wild and should be certain that all native plants purchased for home gardens are nursery-propagated, not wild-collected. For a list of retail sources of nursery-propagated plants and responsibly collected seeds, see elsewhere on this website. Text from 2008 Wildflower of the Year brochure written by W. John Hayden and adapted by him for the web, January 15, 2006.